This name uses Spanish naming customs: the first or paternal family name is Calatrava and the second or maternal family name is Valls. Santiago Calatrava Valls (born 28 July 1951) is a Spanish architect, structural design and analyst engineer, sculptor and painter, particularly known for his bridges supported by single leaning pylons, and his railway stations, stadiums, and museums, whose sculptural forms often resemble living organisms. His best-known works include the Milwaukee Art Museum, the Turning Torso tower in Malmö, Sweden, the Margaret Hunt Hill Bridge in Dallas, Texas, and his largest project, the City of Arts and Sciences and Opera House, in his birthplace, Valencia. His architectural firm has offices in New York City, Doha, and Zürich. 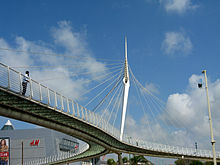 Calatrava was born on July 28, 1951, in Benimàmet, an old municipality now part of Valencia, Spain. His Calatrava surname was an old aristocratic one from medieval times, and was once associated with an order of knights in Spain. He had his primary and secondary schooling in Valencia, and, beginning in 1957, studied drawing and painting at the School of Applied Art. In 1964, as the regime of General Francisco Franco relaxed and Spain became more open to rest of Europe, he went to France as an exchange student. In 1968, after completing secondary school, he went to study at the Ecole des Beaux Arts in Paris, but he arrived in the midst of student uprisings and turmoil in Paris, and returned home. Back in Valencia, discovered a book about the architecture of Le Corbusier, which persuaded him that he could be both an artist and an architect. He enrolled in the Higher School of Architecture at the Polytechnic University of Valencia. He received his diploma as an architect and then did higher studies in urbanism. At the University he completed independent projects with fellow students, publishing two books on the vernacular architecture of Valencia and Ibiza. In 1975 he enrolled in the Swiss Federal Institute of Technology in Zürich, Switzerland for a second degree in civil engineering. In 1981 he was awarded a doctorate in the department of architecture, after completing his thesis on "The Pliability of three-dimensional structures." Speaking of this period, Calatrava told biographer Philip Jodidio:"The desire to start all over at zero was very strong in me. I was determined to put to one side all that I had learned in architecture school, and to learn to draw and think like an engineer. I was fascinated by the concept of gravity and convinced that it was necessary to begin work with simple forms." Calatrava explained that he was particularly influenced by the work of the early 20th century Swiss engineer Robert Maillart (1872-1940), which taught him that, "with an adequate combination of force and mass, you can create emotion." As soon as Calatrava completed his doctorate in 1981, he opened his own office in Zurich. He designed an exposition hall, a factory, a library, and two bridges, but none were built, Finally in 1983, he began to receive commissions for industrial and transportation structures of increasingly greater size; he designed and built the Entrepôt Jakem, a warehouse in Münchwilen, Thurgau, Switzerland, another warehouse in Coesfeld-Lette, Germany, an addition to the main post office in Lucerne, Switzerland; a bus shelter in Saint-Gall, Switzerland (1983–85) the roof of a school in Wohlen, Switzerland (1983–88), and then some major projects; a new hall for the railway station in Lucerne (1983–89) and then an entire train station, the Zürich Stadelhofen railway station in Switzerland (1983–1990). The train station has several of the features that became signatures of his work; straight lines and right angles are rare. The railroad platforms curve, the supporting columns lean, the concrete walls of the modernistic cavern beneath the tracks are everywhere pierced with teardrop shaped skylights, and tilting glass panels provide light and shelter without enclosing the platforms. In 1984–87, he built his first bridge, the Bac de Roda Bridge in Barcelona, Spain, which for the first time brought him international notice. The bridge, designed for cyclists and pedestrians, connects two parts of the city by crossing a wasteland of railway tracks. It is 128 metres (420 ft) long, with twin arches which lean at an angle of thirty degrees; a feature which quickly became the stylistic signature of Calatrava. The upper portion of the bridge, composed of steel arches and cables, is light and airy, like a network of lace, anchored to the massive concrete supports and granite pillars below. 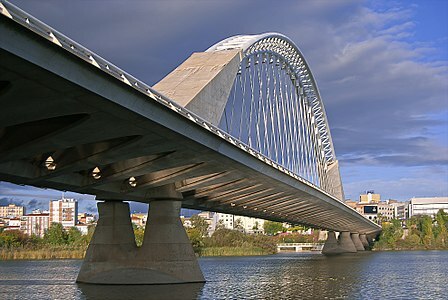 His next bridge, the Puente del Alamillo (1987–1992), in Seville, Spain, was even more spectacular and cemented his reputation. Built as part of the 1992 Expo 92, it is 200 metres (660 ft) long, crossing the Meandro San Jeronimo River. Its main feature is a single pylon 142 metres (466 ft) high, leaning to 58 degrees, the same angle as the Great Pyramid of Giza in Egypt in Africa. The weight of the concrete of the pylon is sufficient to hold up the bridge with just thirteen pairs of cables, eliminating the need for any cables behind it. Llonja de Sant Jordi, Alcoy (Alicante), Spain. (1992–95). At the beginning of the 1990s Calatrava built several remarkable railway stations and bridges, but broadened his portfolio by designing a wider range of structures, including a Canadian shopping center, and a new passenger terminal for Bilbao airport. and his first building in the United States, the new structure of the Milwaukee Art Museum. In 1992 he completed one of his most picturesque and sculptural works, the Montjuïc Communications Tower in Barcelona (1989–92), a 136 m (446 ft)-high graceful concrete spire designed for the site of the 1992 Olympics. The concrete pylon leans backwards, and seems to grasp the vertical broadcast antennas. Its form suggests an athlete about to throw a javelin. The circular building at the base of the tower, which contains the broadcast equipment, is clad in white bricks and is equipped with metal resembling an eye which opens and closes. The building has a particularly Catalan touch, borrowed from the park benches of Park Güell of Antonio Gaudi: a decoration of colorful ceramics tiles. The square next to it is laid out like a giant sundial, on which the tower casts its shadow. 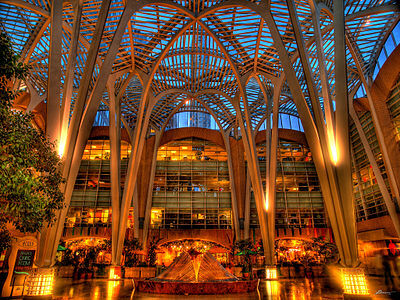 In 1992 he also finished his first North American project, the Allen Lambert Galleria in Toronto, Ontario, Canada. The interior of the shopping mall is covered by a glass roof supported by columns like gigantic trees, a modern version of the Belle Epoque Les Halles market in Paris. Two years later, in 1994, he completed another notable train station, the Gare de Lyon Saint-Exupéry (1989–1994) at the Lyon airport in Satolas. This building was designed to be both a functional link between the airport and train station, the terminal for the high-speed TGV trains, and a symbol of the Rhone-Alps Region. The station is covered by a giant shell of steel and glass, 120 by 100 metres (390 by 330 ft), suspended at a maximum height of 40 metres (130 ft), and weighing 1,300 tonnes (1,300 long tons; 1,400 short tons). It is connected with the airport terminal by a 180 metres (590 ft) long glass and concrete bridge. The glass and steel sides and skylights of the terminal from the inside resemble a modernistic cathedral; the glass panels at the top are intended to suggest flight. From the outside, the station has been said to resemble a prehistoric animal, while the glass-and-steel bridge has been compared to a bird or a manta ray. 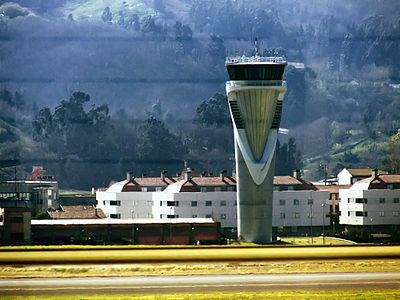 One of his last projects in the 20th century was the Bilbao Airport in Spain, notable both for its unusual control tower, 42 metres (138 ft) high — made of concrete clad with aluminum, which widens as it grows taller, and which resembles a statue holding its hands in front of it — and for terminal buildings, where the white concrete structures are united with aluminum forms. The terminal buildings themselves lift upwards and seem to be trying to take off, giving them the airport the popular nickname of "The Dove". Following 2000, Calatrava completed a new addition to the Milwaukee Art Museum, a concert hall in Tenerife in the Canary Islands, a twisting skyscraper in Malmö, Sweden, and a City of Arts and Sciences in Valencia, Spain. in Sweden, and a wooden castle-like winery in Spain, all in astonishing forms and all seemingly in motion. The Quadracci Pavilion of the Milwaukee Art Museum (1994–2001) was Calatrava's first building in the United States, and his first museum. It displayed the technical innovations and forms he had first used in his railway stations and airports, but with more freedom of form and architectural theatrics. It is an addition to an existing building, constructed by Eero Saarinen in 1957 next to Lake Michigan, with a later addition in 1975 by David Kahler. The purpose of the new pavilion, as defined by the museum board, was to give the museum a new entrance, and especially "to redefine the identity of the museum with a strong image." 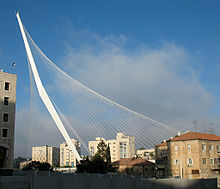 Calatrava's design was selected after a competition entered by seventy-seven architects. Calatrava's solution was a glass and steel entry hall 2 metres (6.6 ft) high with a moveable sun screen roof, composed two large wings made up of twenty-six smaller wings, from 8 to 32 metres (26 to 105 ft) in length. The sunscreen, weighing 115 tonnes (113 long tons; 127 short tons), can be hoisted up by a single pylon, like an enormous bird's wing, or lowered when the wind from the lake is stronger than 65 kilometres per hour (35 kn). The interior of the structure has a conference hall, exposition space, shops, and a restaurant overlooking the lake. He also designed a suspension footbridge between the center of the city and edge of the lake. 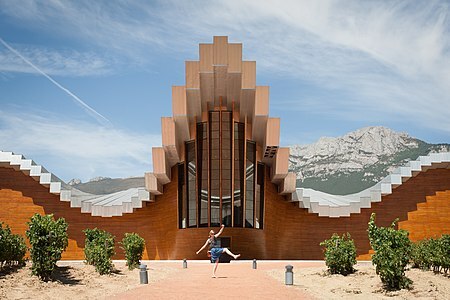 The Bodegas Ysios winery in Laguardia, Spain (1998–2001) was designed as a symbol of the Rioja wines made by that winery. Built on a sloping site surrounded by vineyards, the 196-metre (643 ft) long building has an aluminum roof and a facade covered with laminated wood panels, alternating between convex and concave, with a roofline that ripples like a series of waves. The Turning Torso in Malmö, Sweden, was Calatrava's first skyscraper, and was the first twisting skyscraper, a form which later appeared in other cities around the world from Shanghai to Moscow. The building was originally conceived by the architect as a sculpture of "seven cubes stacked on a steel support creating a spiral structure resembling a twisting spinal column." The tower is 190 metres (620 ft) high, and twists a full ninety degrees from the base to the top. Each of the nine cubes cube is like a separate five story building; each floor contains from one to five apartments. The support holding the structure together is the column of elevators and escalators which communicate between the cubes. A system of discreet cross beams on the exterior frame manage the torsion of the twisting building. In 2016 it was the tallest building in Scandinavia. For the 2004 Olympic Games in Athens, Greece, Calatrava won the commission to cover the existing stadium with a new roof, to make a similar roof for the velodrome, and additionally to build four entrance gateways, a monumental sculpture to symbolize the games, and other architectural features to give harmony and variety to the complex. The roof for the stadium, in the form of bent "leaves" of laminated glass, is designed to reflect 90 percent of the sunlight. The roof covers 25,000 square metres (270,000 sq ft), and is supported by double-tied arches of tubular steel, with a span of 304 metres (997 ft) and a height of 60 metres (200 ft). It is 250 metres (820 ft) long and 20 metres (66 ft) high, suspended by cables from two parabolic arches. The Velodrome has a white cap supported by two concrete arches 45 metres (148 ft) high, weighing 4,000 tonnes (3,900 long tons; 4,400 short tons), from which the glass and steel roof is suspended. Calatrava also designed an enormous parabolic arch at the entrance and the Wall of Nations, a mobile sculpture of tubular steel which moves in a wavelike patterns. 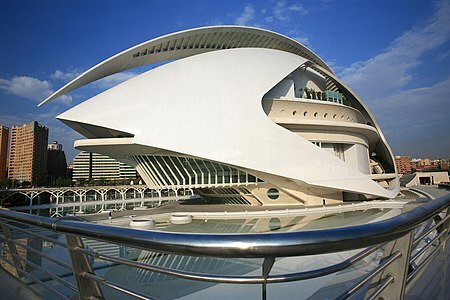 The largest group of buildings by Calatrava is found in his birthplace, Valencia, Spain, and was built in over a decade. It includes the City of Arts and Sciences (1991–2000) and the opera house (1996–2006), all constructed on a plot of 35 hectares between a highway and a river on the east side of the city. The planetarium, like a half-sunken globe, is placed in the center, next to a large artificial lake, in which it seems to be sinking. The dome is covered by a metal screen which opens and closes, and the entrance of the dome opens like a human eye. On one side is the science museum, behind a line of leaning columns, and on the other is the newest structure, the massive shell of the opera house, described by Calatrava as a "monumental sculpture", which gives the impression of being continually in motion. 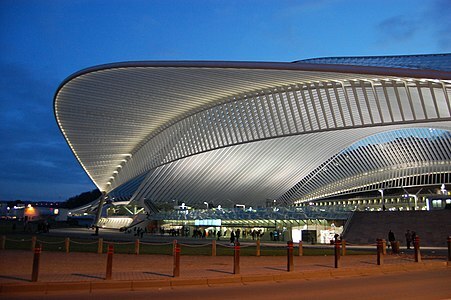 The Liège-Guillemins railway station for high-speed trains in Liege, Belgium is covered with a lace-like roof of glass and steel 160 metres (520 ft) long and 32 metres (105 ft) high, covering the nine tracks and five platforms. The transparent roof seems to eliminate the distinction between indoors and outdoors. The conference center and exposition hall in the Spanish city of Oviedo combines two office buildings and a hotel, covered with horizontal bands of glass and steel and perched upon curving concrete pylons, with elliptical conference center, which includes a main theater, exposition hall and seminar rooms. The Center include another signature feature of Calatrava's work; a moveable sunscreen that folds and unfolds. The ceiling of the concert hall is an ascending series of arcs, which echo the curving rows of seats. Calatrava constructed a series of extraordinary bridges, the type of structure which originally brought him global attention, for cities around the world that wanted a symbol of modernity and daring. 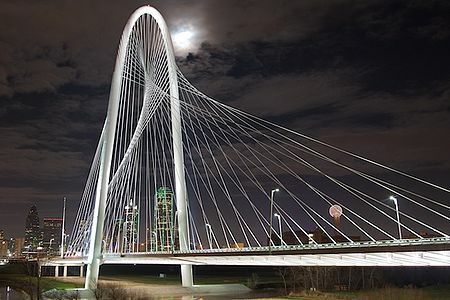 Among the largest and dramatic are three bridges over the Trinity River in Dallas, Texas. The first of these was the Margaret Hunt Hill Bridge, opened for traffic in March 2012. The bridge, carrying six lanes of traffic, is 209 metres (686 ft) long, with the appearance of being suspended from an arc-shaped tubular steel pylon forty stories or 136 metres (446 ft) high by fifty-eight cables, ranging in length from 119 to 196 metres (390 to 643 ft). In form, the bridge resembles one of three bridges constructed in 2005-2005 on the Autostrada A1 in Reggio Emilia, Italy. Work on the second bridge, the Margaret McDermott Bridge, began in 2011. The project for the new Florida Polytechnic University in Lakeland, Florida (2009–2014) gave Calatrava the opportunity to design an entire campus in a unified style. The site covers 170 acres (69 ha) of land which once contained phosphorus mines, many of which have been filled with water creating small lakes.Calatrava's plan combined several small lakes into a central lake, which serves as a setting for the central structure, the Innovation, Science and Technology building. The eye-shaped central building has an area of 200,000 square feet on two floors, and contains all the classrooms, faculty offices laboratories and public spaces until the other buildings are completed. The building has several signature Calatrava features, including an extendable sun scene on the roof, which entirely changes the appearance of the building when deployed, and whose form changes gradually as the sun moves. The terraces of the building are covered by a curving pergola, or screen, of steel, which reduces the direct sunlight by thirty percent. Inside, the corridors and central courtyard are lit by the central skylight. Plans for the building call for the installation of 1,860 square metres (20,000 sq ft) of solar panels on the sunscreen to provide energy for the building. The library of the university is also distinctive; it does not have a single book; all the collection is digitized. 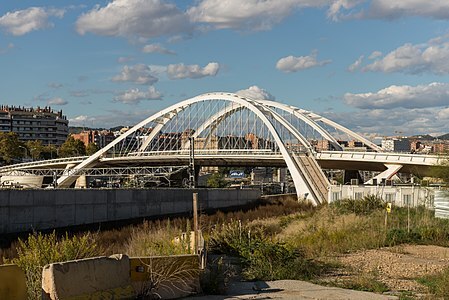 The structure has been called by some journalists a response to the criticism of the high price and technical flaws of some of Calatrava's earlier buildings. The review in Archiecture magazine, the journal of the American Institute of Architects, reported: "The building is full of handsome and even some very impressive spaces, but none of the singularly breathtaking ones that have made Calatrava, despite his price tag, so attractive to clients looking for marketing splash to go with their museum wing or train station. It reflects serious attention to detail and the bottom line; this is the work of an architect actively trying to prove, or at least re-emphasize, his bona fides." 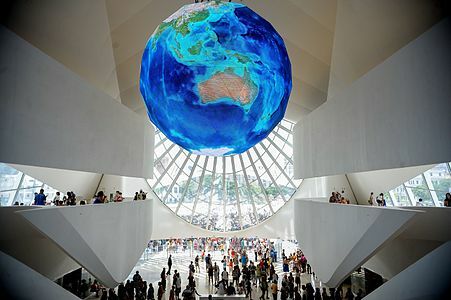 The Museum of Tomorrow in Rio de Janeiro, Brazil, which opened in December, 2015, is part of the redevelopment of the waterfront of Rio de Janeiro, and opened in time for the 2016 Summer Olympics in that city. The building is sited on a 7,600 square metres (82,000 sq ft) plaza next to the harbor, and surrounded by reflecting pools. The building is cantilevered 75 metres (246 ft) over the plaza, and 45 metres (148 ft) toward the sea. and gives the impression that it is floating on the water. Calatrava wrote, "The idea is that the building feels ethereal, almost floating on the sea, like a ship, a bird or a plant." The roof is equipped with moveable screens that adjust to the movements of the sun. The interior design is what Calatrava calls "archetypal" and simplified, to allow for exhibits in a greater variety of forms and sizes. The museum also includes a number of ecological features; water from the sea is used to regulate the temperature inside the building, and to refill the surrounding reflecting pools. The Guardian described it as "an other-worldly edifice that looks like a cross between a solar-powered dinosaur and a giant air conditioning unit", and declared "it must already rank as one of the world’s most extraordinary buildings." Calatrava designed the WTC Transportation Hub in New York City at the rebuilt World Trade Center at the site of the September 11 attacks in 2001. The new station connects the regional trains of the new PATH with the subway and other local transportation, and also has a large retail mall, replacing commercial space destroyed in the attack. The above-ground "oculus" of the station, made of glass and steel, is oval-shaped, and is 35 metres (115 ft) long and 29 metres (95 ft) high. According to Calatrava, it resembles "a bird flying from the hands of a child". The "Wings" of the above-ground structure were originally designed to move upward to a maximum height of 51 metres (167 ft) to form a double screen 51 metres (167 ft) high, but this feature had to be dropped to meet new security standards. The main hall of the station is 10 metres (33 ft) underground, and the tracks of the PATH system on another level 8 metres (26 ft) below. The underground station was originally designed so that its roof would open entirely in good weather, but this feature also had to be dropped due to its cost and space limitations. 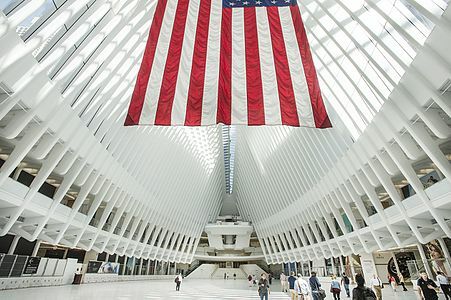 The WTC Hub has been controversial because of its cost (4 billion dollars, twice the original estimate, and the most expensive railway station ever built) and its delays (seven years on March 3, 2016, seven years behind schedule). More than $1 billion of its cost went to administrative expenses and the decision to build around the 1 train of the New York City Subway. Michael Kimmelman, the architecture critic of the New York Times, praised the soaring upward view inside the Oculus, but condemned the building's cost, "scale, monotony of materials and color, preening formalism and disregard for the gritty urban fabric." After years of praise and commendation, in 2013 some of Calatrava's projects began to draw criticism on the grounds of their cost, delays, and functional problems. Many of these criticisms were packaged together in an article by Suzanne Daiey in the New York Times on September 13, 2013, entitled "Santiago Calatrava collects critics as well as fans." Daley wrote: "...in numerous interviews, other architects, academics and builders say that Mr. Calatrava is amassing an unusually long list of projects marred by cost overruns, delays and litigation. It is hard to find a Calatrava project that has not been significantly over budget. And complaints abound that he is indifferent to the needs of his clients. In 2013 a Dutch councillor in Haarlemmermeer, near Amsterdam, urged his colleagues to take legal action because the three bridges the architect designed for the town cost twice the budgeted amount and then millions more in upkeep since they opened in 2004." 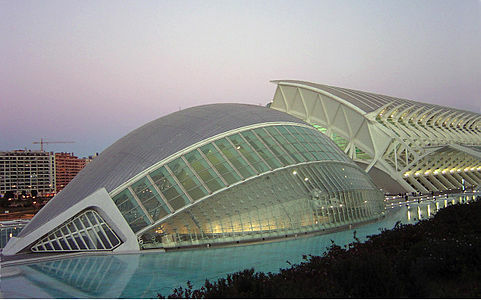 Much of the criticism focused on the City of Arts and Sciences in Valencia, originally budgeted for about $405 million. Ignacio Blanco, the leader of a small opposition party in Valencia, blamed Calatrava of spending nearly three times the original budget, and accused the region of paying him approximately $127 million for his work, though the complex was originally lacking elevators for the disabled, and the opera house had 150 seats with obstructed views. In 2013 Calatrava sued his critic for defamation, and won. Some of the problems with Calatrava's projects have been caused by an excess of innovation and insufficient testing. The glass tiles on the floor of his bridge in Bilbao became slippery in the rain, causing an increased number of claims for injuries and forcing the installation of a black anti-slip carpet on the decking, which blocked the view of the river through the walkway. The metal arches he put over some landscaped gardens sometimes overheated in the sunshine, baking the vines that were supposed to grow on them. The attractive aluminum and wood covering of the winery in Spain leaked water, interfering with the winemaking and requiring extensive repairs. The ceramic tiles on the surface of the opera house in Valencia, placed as a tribute to Antonio Gaudi, buckled in the heat because concrete and ceramics expand and contract at different rates when temperatures change. Calatrava was sued for the cost of repairs on the bridge in Venice and on several other projects, but won in court. Much of the criticism focused on Calatrava's WTC Hub, which was completed in 2016 for a cost of $4 billion, twice what was expected and seven years behind schedule. Calatrava was paid a fee of 80 million dollars. Some of the additional cost and delay was due to additions and modifications to the original plan by the project owners, the Port Authority of New York and New Jersey, rather than the architect. Calatrava's original entry pavilion was scaled back for security reasons and the mechanism for opening the roof to the gallery below was eliminated because of budget and space restraints. Even before it opened the station was a target of criticism: the New York Post described the station in 2014 as it was being built as "a self-indulgent monstrosity" and "a hideous waste of public money". Michael Kimmelman, architecture critic for The New York Times, referred to the structure as "a kitsch stegosaurus". New York magazine referred to it in 2015 as it neared completion as a "Glorious Boondoggle". The New York Post editorial board also described the station when it opened in 2016 as the "world's most obscenely overpriced commuter rail station — and possibly its ugliest", comparing the Oculus to a "giant gray-white space insect". The Hub also had its defenders. Jimmy Stamp of The Guardian wrote: "I despised the new World Trade Center transportation hub before I even saw it. It’s $2bn over budget, has suffered from construction problems and design compromises, it’s seven years late and still incomplete, and its architect, Santiago Calatrava, has left a trail of lawsuits and angry clients around the world....But when I was standing on the marble floors in its enormous, gleaming central concourse two stories below street level, staring up at a clear blue sky between bone-white ribs vaulting 160ft over my head, I, like Jonah in the whale, repented – at least for the moment....We deserve grand expressions of our artistic and technological capabilities. We deserve public spaces that inspire. The Oculus is deeply flawed, but I appreciate its aspiration and grandeur.... The Oculus presents a more optimistic vision, one based less on present realities and more on future possibilities. Less Blade Runner, more Star Trek. By the time we get to that future, whichever one it may be, the delays and the cost and the controversies will be forgotten, but we will be left with a luminous great hall in the heart of downtown New York." Calatrava himself observed that he was particularly influenced by the work of engineers such as the Swiss Robert Maillart (1872–1940), whose work inspired him to seek simple forms which could create an emotional response. Calatrava defined his objective this way in 2016 in a book about his work: "My major interest is the introduction of a new formal vocabulary, composed of forms adapted to our time." Calatrava, a sculptor, has also spoken frequently about the connection between sculpture and architecture in his work. "In sculpture, I have often used spheres, cubes and other simple forms often connected with my knowledge of engineering." 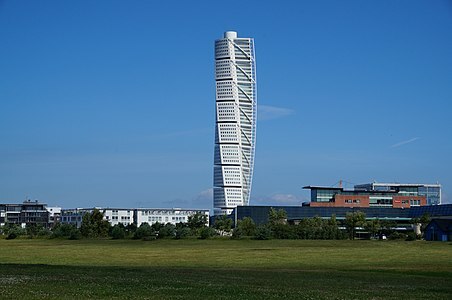 He noted that his Turning Torso building had originally been conceived as a work of sculpture, and he praised the liberties taken by Frank Gehry and Frank Stella in creating sculptural art, but he also noted the differences. In 1997 he wrote that "architecture and sculpture are two rivers in which the same water flows. Think of sculpture as a pure plastic art while architecture is a plastic art which is submitted to function, taking into consideration the human scale." Calatrava also noted the influence of the sculptor Auguste Rodin, citing Rodin's words in his 1914 book Cathedrals of France: "The sculptor only achieves the greatness of expression in concentrating his attention on harmonic contrasts of light and shadow, exactly as an architect does." Movement is also an important element in the architecture of Calatrava. He noted that many 20th century sculptors, such as Alexander Calder, made sculptures that moved. He wrote his own university thesis on "The Flexibility of three-dimensional structures," and described how objects, by moving, could shift from three dimensions to two and even to one. Moving elements which folded and expanded became an important element of almost all of his projects. "Architecture itself moves", he told a biographer, "and, with a little chance, becomes a magnificent ruin". Calatrava is also a sculptor and painter. Some of his architectural works, most notably the Turning Torso in Malmö, Sweden, were originally works of sculpture. In 2006, the Metropolitan Museum of Art in New York City held a special one-man exhibition of Calatrava's drawings, sculpture, and architectural models, entitled Santiago Calatrava: Sculpture Into Architecture. In 2012, the Hermitage Museum in St. Petersburg held an exhibition of his work and this was followed up by an exhibition at the Vatican Museum in Rome. Eight of his sculptures were displayed along Park Avenue in New York City in the spring of 2015, between 52nd and 55th Streets. 1999, New York Times Capsule, U.S.A.
Dubai Creek Tower, Dubai, UAE (ground broken, scheduled for completion in 2020; in competition for world's tallest structure. Calatrava has received numerous awards for his design and engineering work. In 1988, he was awarded with the Fazlur Khan International Fellowship by the SOM Foundation. In 1990, he received the "Médaille d'Argent de la Recherche et de la Technique", in Paris. In 1992 he received the prestigious Gold Medal of the Institution of Structural Engineers. In 1993, the Museum of Modern Art in New York held a major exhibition of his work called "Structure and Expression". In 1998 he was elected to become a member of "Les Arts et Lettres", in Paris. In 2005 he received the Gold Medal from the American Institute of Architects (AIA). In 2005, Calatrava was awarded the Eugene McDermott Award by the Council for the Arts of MIT. He is also a Senior Fellow of the Design Futures Council. Calatrava has received a total of twenty-two honorary degrees in recognition of his work. In 2013, Calatrava was awarded an honorary doctorate from Georgia Institute of Technology, an award that has only been given to a small number of people. 2011: On 10 December, Calatrava was appointed a member of the Pontifical Council for Culture for a five-year renewable term by Pope Benedict XVI. ^ a b Taschen & Taschen 2016, p. 108. ^ "Santiago Calatrava Biography - life, family, children, name, story, wife, school, mother, young - Newsmakers Cumulation". www.notablebiographies.com. Retrieved 2016-01-18. ^ a b c d Jodidio 2016, p. 7. ^ "Biography: Santiago Calatrava". Southern Methodist University News. 7 October 2002. Retrieved 12 November 2013. ^ a b c Jodidio 2016, p. 91. ^ a b Jodidio 2016, p. 33. ^ a b Jodidio 2016, pp. 63-65. ^ Jodidio 2016, p. 67. ^ Jodidio 2016, p. 67-69. ^ "Athens Olympics Sports Complex". Arcspace.com. Retrieved February 4, 2017. ^ Jodidio 2016, p. 47-51. ^ Jodidio 2016, pp. 70-71. ^ Rogers, Tim (June 22, 2011). 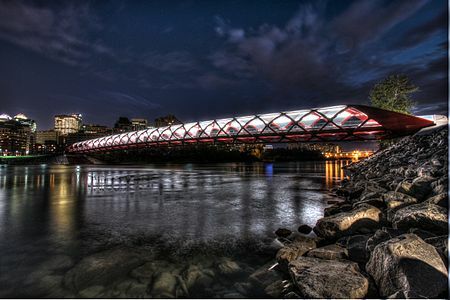 "Is Our Calatrava Bridge a Copy of Reggio Emilia's?". FrontBurner. Dallas, Texas: D Magazine Partners, Inc. Archived from the original on January 2, 2017. Retrieved January 2, 2017. ^ Rago, Danielle (March 7, 2012). 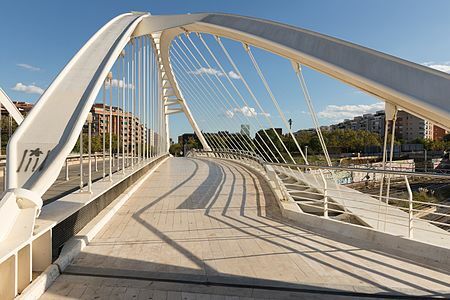 "Building As Icon: Santiago Calatrava's first completed bridge in the United States evokes Eero Saarinen's Gateway Arch in shape and motivation". Domus. Dallas, Texas. Archived from the original on April 7, 2013. Retrieved January 2, 2017. ^ Jodidio 2016, p. 93. ^ Jodidio 2016, p. 81. ^ Hawthorne, Christopher (2014-10-13). "Florida Polytechnic University, Designed by Santiago Calatrava". Architect. Retrieved 2017-03-17. ^ Rosenfield, Karissa (2015-12-17). 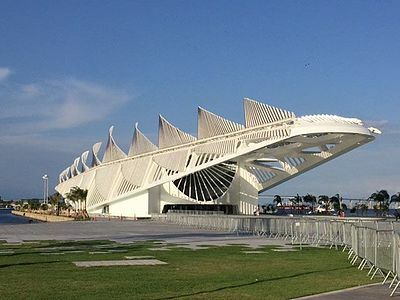 "Santiago Calatrava's Museum of Tomorrow Opens in Rio de Janeiro". ArchDaily. Retrieved 2017-03-17. ^ Murdock, James (October 10, 2010). "Calatrava's "Museum of Tomorrow" to Showcase a Greener Future for Rio". Architectural Record. Retrieved May 29, 2014. ^ Watts, Jonathan (2015-12-17). "Museum of Tomorrow: a captivating invitation to imagine a sustainable world". the Guardian. Retrieved 2017-03-17. ^ a b Jodidio 2016, p. 77. ^ "Why The World Trade Center Transportation Hub Is Going To Cost $4 Billion". Business Insider. Retrieved 2017-02-04. ^ a b c Daley, Suzanne (13 September 2013). "A Star Architect Leaves Some Clients Fuming". The New York Times. Retrieved 13 September 2013. ^ Kimmelman, Michael (2 March 2016). "Santiago Calatrava's Transit Hub Is a Soaring Symbol of a Boondoggle". Retrieved 17 March 2017 – via NYTimes.com. 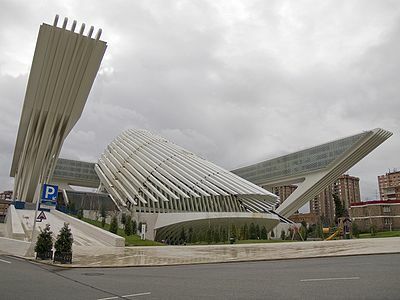 ^ "Santiago Calatrava wins legal battle against 'insulting and degrading' website". De Zeen Magazine. De Zeen Magazine. Retrieved 2014-05-30. ^ a b Daley, Suzanne (2013-09-25). 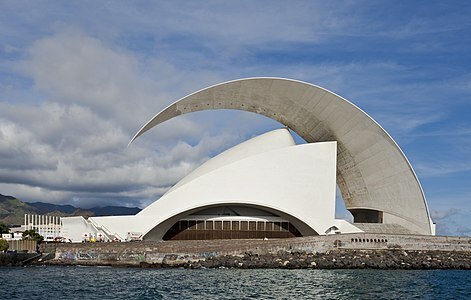 "Santiago Calatrava Collects Critics as Well as Fans". The New York Times. Retrieved 2017-03-17. ^ Walker, Alissa. "Can You Guess How Much NYC Paid The Architect Of The Most Expensive Train Station On Earth?". Retrieved 17 March 2017. ^ Dunlap, David W. (July 2, 2008). "Design of Ground Zero Transit Hub Is Trimmed". New York Times. Retrieved July 13, 2008. ^ Kimmelman, Michael (2014-12-02). "Michael Kimmelman on Twitter". Twitter. Retrieved 2015-04-01. ^ Rice, Andrew (2015-03-12). "The Glorious Boondoggle". New York. Retrieved 2015-04-01. ^ "New York's Oculus transit hub soars, but it's a phoenix with a price tag". Retrieved February 7, 2017. ^ "Calatrava, Santiago". www.infoplease.com. Retrieved 2017-02-04. ^ "Architectural Record - News, Continuing Ed, Products, Green Bldg". Retrieved 17 March 2017. ^ Jodidio 2016, p. 8. ^ Taschen & Taschen 2016, p. 111. ^ Jodidio 2016, p. 11. ^ Jodidio 2016, p. 19. 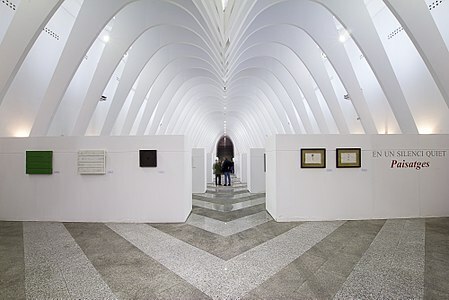 ^ "'Santiago Calatrava: The Quest for Movement' Exhibition". Arch Daily. 2 July 2012. Retrieved May 29, 2014. ^ "Santiago Calatrava: The Metamorphosis of Space". Arch Daily. 5 December 2013. Retrieved May 29, 2014. ^ Chaban, Matt (March 21, 2014). 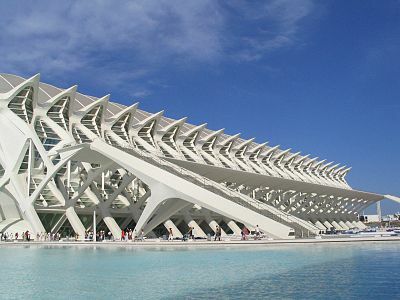 "The canvas and creativity drive renowned architect Santiago Calatrava's structures". New York Daily News. Retrieved May 29, 2014. ^ "Sculpture by Santiago Calatrava to be unveiled at SMU's Meadows Museum". Southern Methodist University News. 7 October 2002. Retrieved 13 November 2013. ^ Nayeri, Farah (2017-02-02). "Santiago Calatrava to Design His First London Complex". The New York Times. Retrieved 2017-03-17. ^ Kim, Soo (October 12, 2016). "New Dubai skyscraper to surpass the world's tallest building". The Telegraph. Retrieved 2017-03-17. ^ "Santiago Calatrava Awards". Retrieved May 29, 2014. ^ "SOM Foundation Fellows Archive". Archived from the original on July 16, 2011. ^ Established to honor Eugene McDermott, founder of Texas Instruments and long-time friend and benefactor to MIT, the award was created by the Council for the Arts at MIT in 1974, and further endowed by Eugene's wife, Margaret. Since its inception, the Council has bestowed the award upon 31 individuals producing creative work in the performing, visual and media arts, as well as authors, art historians and patrons of the arts. ^ "Senior Fellows - Design Futures Council". Design Intelligence. Archived from the original on 6 November 2007. Retrieved 13 November 2013. ^ Treadaway, Dan (Fall 2013). "Santiago Calatrava: Blurring Boundaries". Georgia Tech. Retrieved May 29, 2014. ^ Herman, Lisa. "Architect John Portman honored with Council for Quality Growth's Four Pillars Award", Georgia Tech, November 10, 2013. Accessed May 29, 2014. "...Doctorate of Philosophy by Georgia Tech, an accolade only a handful of individuals have achieved..."
^ "YouTube - Dr. Santiago Calatrava Receives Honorary Degree and Remarks". youtube.com. Retrieved 29 April 2014. ^ AGENCIA EFE (10 October 2016). "Santiago Calatrava recibe Honoris Causa del Instituto Politécnico Nacional de México". Retrieved 17 March 2017 – via YouTube. ^ Davidson, Justin (2013-04-28). "Santiago Calatrava's Three Sons". NYMag.com. Retrieved 2017-03-17. Jodidio, Philip (2016). Calatrava (in French). Taschen. ISBN 978-3-8365-3564-9.